We strolled into Zagreb not expecting all too much. I’ll admit that I’d fallen for the usual rumours that Zagreb was dull, boring, and there wasn’t really much to see. Thus, on a gloomy winter eve we strolled through a light rain fall towards Day and Night Hostel. We were welcomed by charismatic staff who were more than willing to share a chuckle or two with us or at our expense. We felt welcomed immediately upon arrival. In our few days we found out that the demise of Zagreb is greatly exaggerated. The city was far more lively than most of the others we’ve visited in Europe **cough Vienna cough**. And sure, it seems to suffer from some of the same afflictions of the other capitals, but it is not in the least as much dull. Anyways, this is my review of Day and Night Hostel in Zagreb. 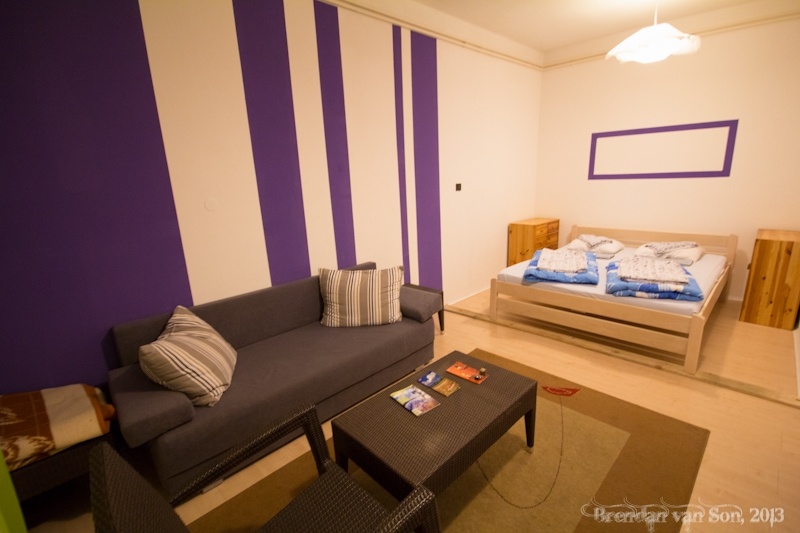 The location of Day and Night Hostel is ok. It’s about a 5 minute walk to the train station, and only a 10 minute walk to the heart of the city and the major tourism sites in Zagreb. I would have, however, liked to be a little bit closer to the tourist zone. There weren’t that many restaurants right around the hostel which meant going out for dinner was a little bit of a hike. You are right beside the metro line here, though. The rooms are good. We had the chance to stay in both the hostel dorm rooms as well as one of the apartments. The apartments are in another building across the street and are really good value. It’s quiet over there and you have the use of your own kitchen and the apartments give you plenty of privacy. The dorms are well set up. Each bunk has its own plugin and light. There is also plenty of space to toss out your luggage, and there are big lockers under the beds as well. My only issue is that the dorms are right outside the common room which means that if people are watching TV, you can hear every word as if you were right in front of the TV yourself. 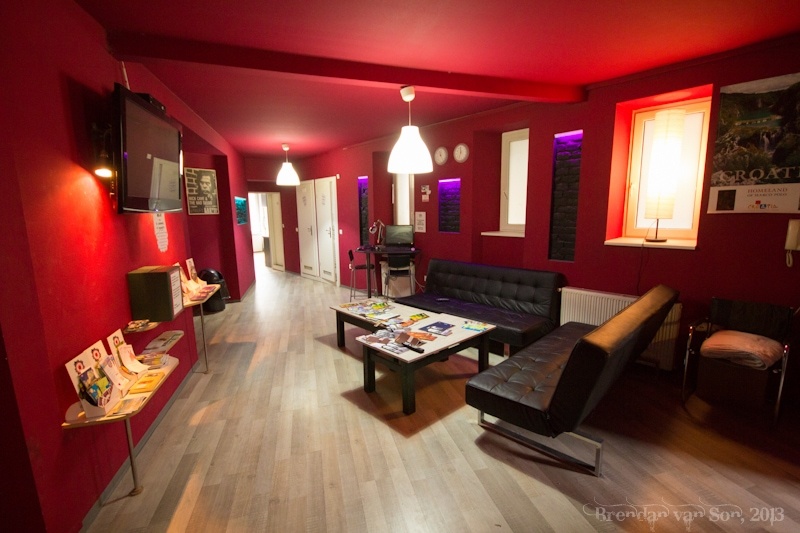 You have basically all you would expect a respectable hostel in Europe to have at Day and Night Hostel in Zagreb. There is really good WiFi throughout the hostel and in the apartments. There is a small common area fit with couches, a flat screen TV, and lots of reading material. The kitchen is big, and is well stocked with the things you’d need to cook. There is also a laundry service here. Day and Night Hostel has a cool atmosphere, and as mentioned in the intro, the staff of the hostel are always welcoming and more that willing to share a laugh and a story with you. They are also good at ensuring that everyone is entertained either at the hostel or outside of it. They will go out of their way to help you sort out tours in town and out to places like Plitvice Lakes. There’s definitely a “hip” feel to the atmosphere at the hostel. Though it’s not a party hostel, I think that the staff here can definitely help you out in that regard if that’s what you’re after. If you want to a little more information about Day and Night Hostel in Zagreb, check out their website here.